Coconut chutney is such an integral part of any Kerala home. Specially in our home, dosa is like the most consumed breakfast. On an average, we used to have dosa as breakfast all 5 days of the week. There is a reason for it also. My mom’s dosa’s are perfect and absolutely marvellous. I have tried my hands on it, but have never come even close to hers. Since dosa was like our daily breakfast, the side condiment with it also has to be good. You know how we like to complain about everything even though your only job is to sit and eat 😉 Atleast as kids you can be really demanding. I would say, now that I know the pain of cooking everyday, I wouldn’t complain about food that is made by someone, considering the effort behind it 🙂 Coming back to what I was saying, the side dip for dosa in our home was usually either ‘Ulli chammandi’ or ‘Coconut chutney’ or both. 1. In a mixie/grinder, grind grated coconut, shallots, green chilli and salt into a smooth paste. Use little water for grinding. 2. In a pan, heat coconut oil and add mustard seeds. Once it splutters, add broken dry red chillies and curry leaves. 3. To this add the coconut ground paste and add little water to bring it to the desired consistency. If you want the chutney to be thick, then you need not add water. 4. Stir for 1 min and remove from heat. 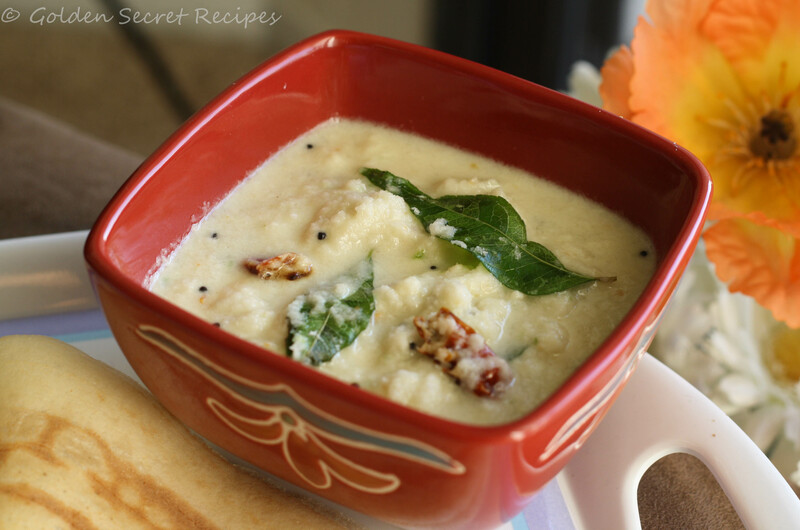 Serve with dosa or idli. 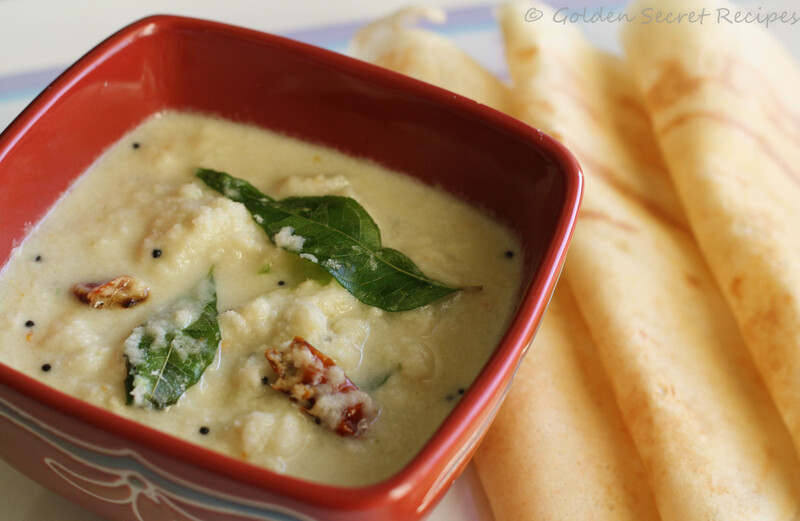 This entry was posted in Quick 'N' Easy Recipes, Sides, Dips 'N More, Specialities-Veggie and tagged coconut chutney, coconut chutney for dosa, coconut chutney for idli, dip for dosa, easy coconut chutney, kerala coconut chutney, kerala thenga chutney, side condiment for dosa, side dish for dosa, thenga chutney for dosa, thenga chutney for idli, white chutney for dosa and idli. Bookmark the permalink.